Over two-thirds of the 68 St Louis neighborhoods that we track favor sellers, according to our Market Action IndexTM, leaving 20 St Louis neighborhoods (32%) that are currently buyer’s markets. 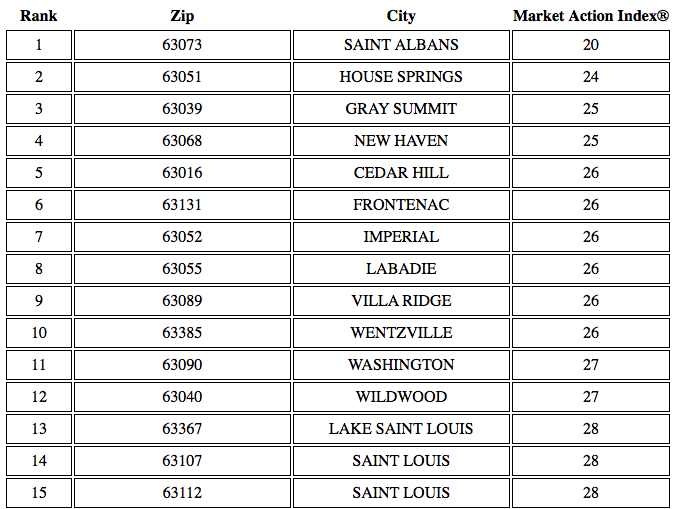 As the table below shows, the top buyers market in the St Louis area as of today is Saint Albans with a Market Action Index of 20, followed by House Springs with a 24. Our Market Action IndexTM looks at supply, demand and inventory for an area and then applies an index value to it based upon 30 begin a balanced market not favoring buyers or sellers. The farther the index goes below a “30” (down to a low of 0) the colder the market is and the more it favors buyers .